Ryan Tafazolli (right) is a possible Posh captain for the 2018-19 season. The Peterborough United captaincy is up for grabs with three leading contenders, according to first-team boss Steve Evans. Defenders Ryan Tafazolli and Jason Naismith and midfielder Alex Woodyard are the men in contention. Naismith and Woodyard only joined the club this summer. Alex Woodyard (centre) could be next season's Posh skipper. All three are expected to play in the opening Posh friendly of the season at Stamford AFC tonight (July 4, 7.30pm). All 10 of the club’s summer signings should take part providing they come through a light training session this morning. 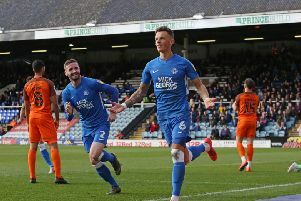 The participation of star men Marcus Maddison and Jack Marriott is less likely as Posh are still hopeful of selling the pair to Championships clubs in the near future. Posh will also field players on the transfer list including last season’s skipper Jack Baldwin, but striker Junior Morias, who held transfer talks with a lower level club yesterday, won’t be involved as he is not fully recovered from an ankle operation. “We will play two different teams for 45 minutes apiece,” Evans said. “All the new signings should be there. We also be taking a few youngsters with us. Jason Naismith (left) could lead Posh out next season. It’s a big night for Evans as he returns to the club he managed in the mid-1990s. He credits the Daniels with kick-starting a success-laden managerial career. “I had a wonderful time at Stamford,” Evans recalled. “It was really my first proper job in football. We won the United Counties League a couple of times and just as importantly I made lifelong friends. “Without the success at Stamford I would never have got the job at Boston United which followed. Chris Turner and Barry Fry put a word in for me as well without my knowledge as they had been impressed with what I did at Stamford. Admission for adults tonight is just £5 with concessions admitted for £3. Children aged between 12 and 17 can gain entry for just £1. Anyone under 12 will be admitted free. Posh are also in friendly action at Bedford (July 7), Peterborough Sports (July 10) and St Neots (July 14) ahead of their pre-season training camp in Portugal from July 15.